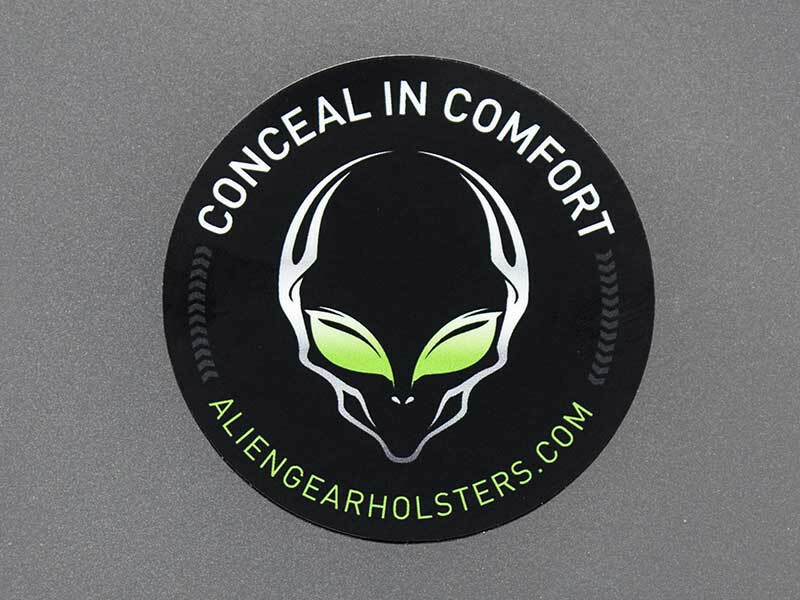 Show your support for the most comfortable concealed carry holsters on the planet with an all-new vinyl Alien Gear Holsters sticker. Available for just .50 cents apiece, you can sport a weather-resistant 3”x3” round sticker featuring our iconic alien head logo anywhere you go! Throw it on the back of your laptop or slap it on your bumper! Similar to our Universal Shell Swap System, the possibilities are endless. Whether you carry your concealed carry handgun with a Cloak Tuck 3.0 IWB Holster (inside-the-waistband) or the customizable Cloak Mod OWB Holster (outside-the-waistband), a few Alien Gear Holsters stickers will be sure to show everyone your support for the best ccw holsters on the planet! Speaking of cool new stuff Alien Gear Holsters has to offer, take a moment to check out our game-changing Cloak Mod OWB Holster. This completely modular and revolutionary paddle holster is capable of carrying multiple handgun models on the same holster base! To carry more than one of your favorite firearms on the same Cloak Mod holster backer, simply swap out your old holster shell for a new one. The Cloak Mod OWB Holster, complete with a Steel Flex Core, is designed to grip your handgun when holstered—and keep it there until you decide otherwise. With the steel insert, you’ll feel and hear a satisfying “click” every time you reholster your semi-automatic handgun. The Cloak Mod is also capable of being adjusted for cant/angle and retention. We here at Alien Gear Holsters wanted to provide you with the option to customize your OWB holster to meet your exact specifications.